Here’s a totally laid back outfit for a chilly weekend. 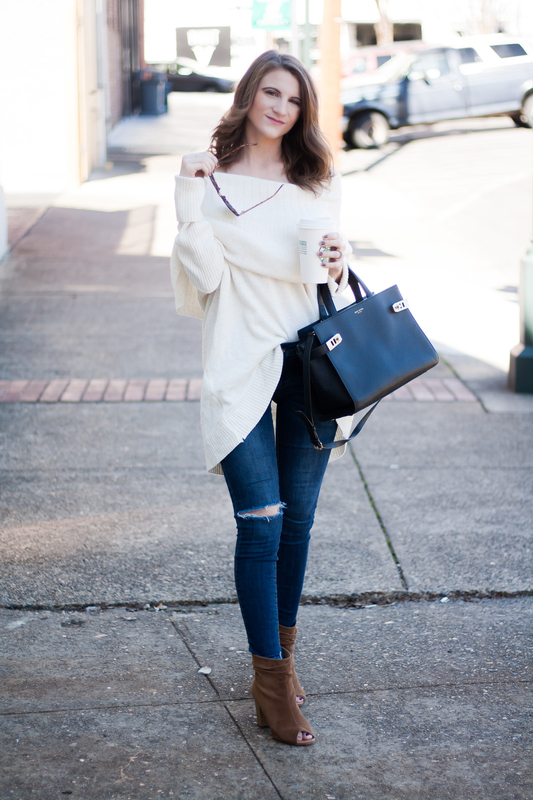 Whether you’re shopping, brunching, or lounging, an oversized off the shoulder (OTS) sweater is for you. 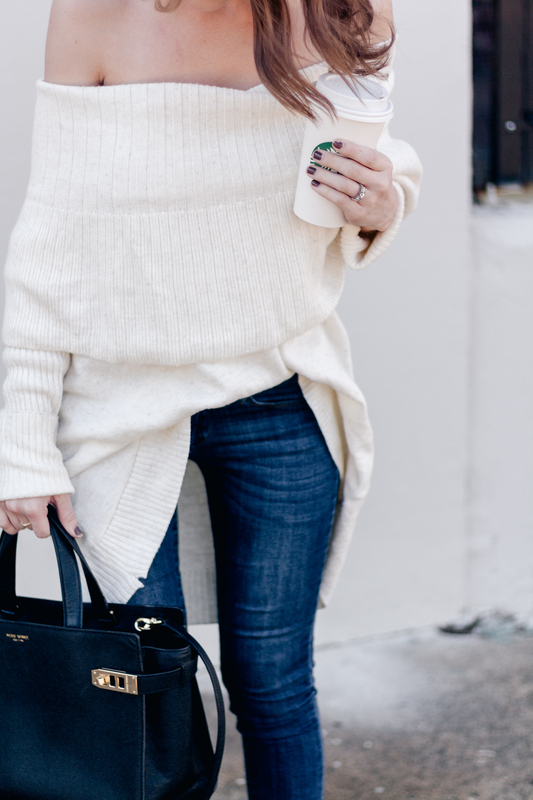 Scroll down to see how I styled this comfy sweater! 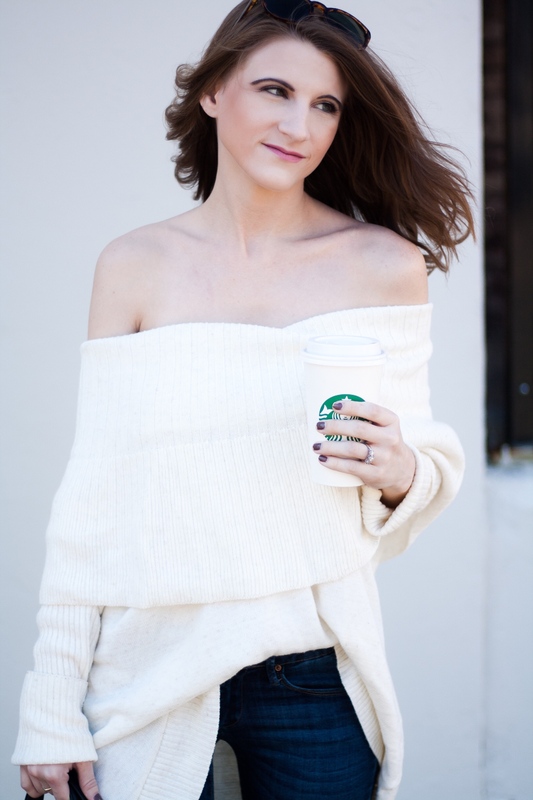 You wouldn’t think that winter weather and the off the shoulder trend would work well together. I thought so too until I bought this sweater about two years ago at my favorite local boutique, Pink Avenue. 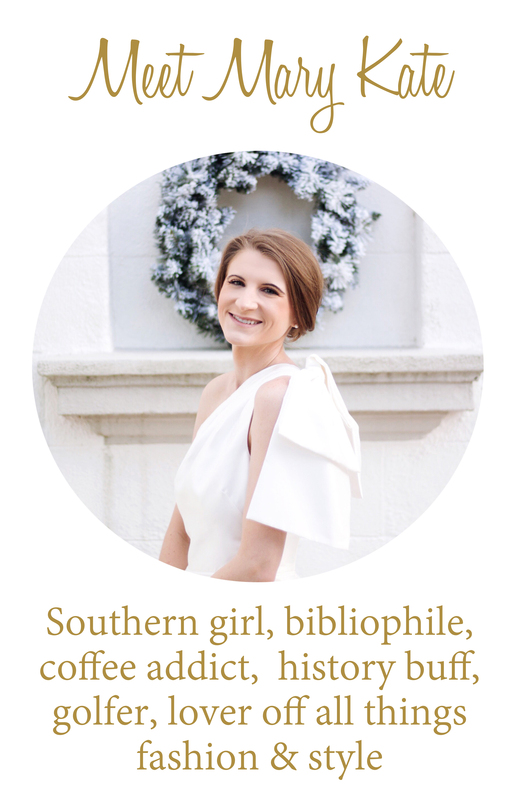 When the weather is chilly rather than freezing (Arkansas has been experiencing 40-50 degree weather over the last few days), the “cold shoulder” trend can be fun to wear. An oversized sweater is one of those things I look forward to when winter rolls around every year. I’m that person who is always cold so a giant, soft sweater is paradise for me. The fold over neckline of this boutique sweater gives the look texture and dimension. The sweater is quite long (which I love) so I tucked it into my jeans in the front. Since this sweater is a bit older, I found almost identical dupes for y’all! Here’s one from Target for $30, H&M for $30, and Lou & Grey for $70. You may have noticed that these distressed jeans have made quite a few appearances on my blog and Instagram as of late. They have quickly become my favorite jeans ever. No joke. They are soft and fit me like a glove. I picked them up from Gray Monroe, an online boutique that features tons of cute and trendy clothing and accessories. And finally, I finished the outfit off with my favorite booties of the moment. These slouchy peep-toe booties by Olivia Miller are amazing. They’re so comfortable so I can wear them all day shopping, running errands, or working.